With just a little salt in your spa water, the system generates chlorine automatically so you’ll spend less time measuring and adding chemicals. This unique system makes spa ownership easier than ever by removing the guesswork and hassle of water care maintenance. One of the primary concerns about owning a spa is water care. Watch the video below to learn how the FreshWater Salt System lets you spend more time relaxing in your hot tub and almost no time maintaining it. The exclusive FreshWater Salt System is an option for all Highlife® Collection and Limelight® Collection spa models. Unique, patent-pending technology makes FreshWater Salt System the best salt water system for hot tubs. The titanium cartridge creates chlorine from salt to sanitise the spa water. Why should I get a FreshWater® Salt System? The FreshWater® Salt System removes the day-to-day hassle of keeping spa water clean, clear and sanitised. This is an affordable, simple, and easy to use system that addresses the water care roadblock for most consumers. How long have chlorine-based salt water systems been used in the pool and spa market? These systems have been around over 40 years. However, the FreshWater® Salt System is unique and the first of its kind with an in-line and disposable design that is easily accessible from the top of the spa. Cartridges can be changed without having to drain the spa or call a service technician. Will other manufacturers or vendors be able to offer the FreshWater® Salt System? The design of the FreshWater® Salt System is patent-pending which means other spa manufacturers or third-party vendors will not be able to offer this product. What testing has been completed for the FreshWater® Salt System? The salt system has been in development and lab testing for over three (3) years while internal and field beta testing has been in progress for the last two (2) years. The results from the beta were very helpful in refining the installation and operation of the system and the feedback was very positive with users indicating that their spa water was much softer (less irritating) and the system was easy to use which resulted in them using their spa even more than with their previous water care system. What is the difference between bottled chlorine and chlorine generated by the FreshWater® Salt System? Like bottled chlorine, the chlorine generated by the FreshWater Salt System is sodium hypochlorite. However, bottled (dry) chlorine contains stabilisers like Cyanuric acid. When stabilised chlorine is repeatedly added to spa water, the Cyanuric acid can accumulate over time and cause the irritation to the skin and eyes typically associated with traditional chlorine water care. With the FreshWater® Salt System there are no stabilising acids added to the water – so the water is softer and more enjoyable. Will my spa water have a strong chlorine smell? The FreshWater® Salt System cleans the water without creating chlorinated or brominated byproducts. It is these byproducts that ultimately lead to the strong chlorine or bromine smell often associated with traditional spa water care. So, it is less likely you will experience any strong chlorine odour when using the FreshWater® Salt System. 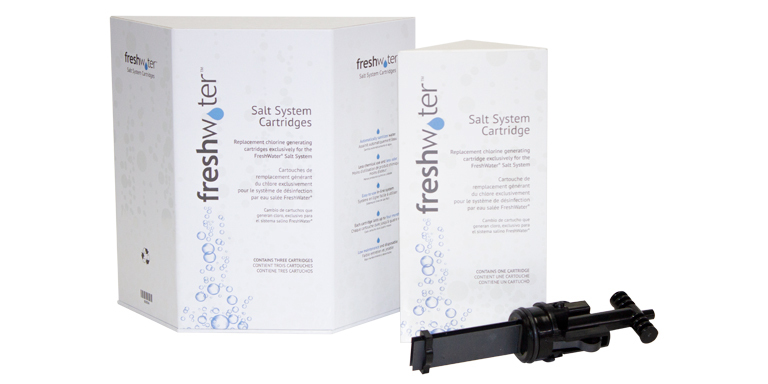 How long will the FreshWater® Salt System cartridge last? The titanium cartridge is designed to last four months. Cartridge life is dependent upon use and on the water being properly balanced and maintained. How do you replace the salt system cartridge? Detailed instructions on how to replace a salt system cartridge can be found on the spa’s control panel or in the FreshWater® Salt System owner’s manual. Does the salt system cartridge need to be cleaned? Typically, the salt system cartridge should not require cleaning before it needs to be replaced. However, this is dependent upon spa usage and on the water being properly balanced and maintained. The cartridge can be cleaned if scaling is found on the electrodes with pH down or diluted vinegar. How much salt does the FreshWater® Salt System use? The amount of salt added to the water is based on the spa size (5-10 cups depending on spa model). This is less than human tears and 10x less than sea water. Will the salt in my hot tub cause corrosion? Unlike pool systems which require high levels of salt (5,000 ppm), the FreshWater® Salt System operates with a minimal amount of salt (1,500-2,000 ppm), which is non-corrosive when the water is balanced to the specified parameters. Can I use table salt in place of the FreshWater® Spa Salt in the spa? Table salt is not recommended for use with the FreshWater® Salt System because it contains iodine and anti-caking agents that will interfere with the systems operation and may cause staining of the spa shell. Will my spa water taste salty? 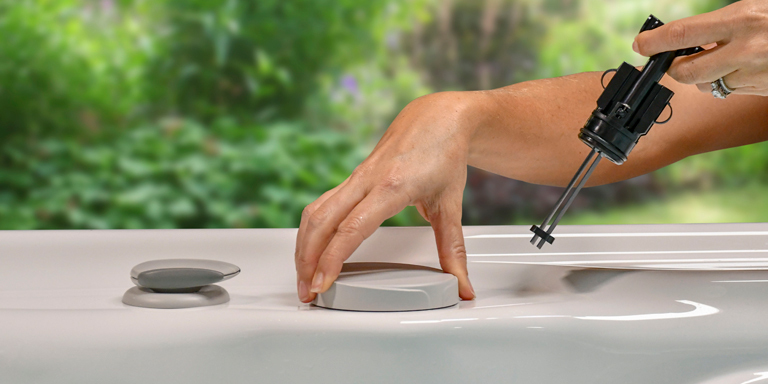 No – the target salt level for spa water when using the FreshWater® Salt System is 1,750 ppm – which is virtually undetectable by taste or smell. For comparison, the salt level of tap water is around 500 ppm, and sea water is around 35,000 ppm. How often do I need to add salt to my hot tub? The FreshWater® Salt System will continually generate chlorine from the salt added to the water at start-up. The hot tub owner only needs to add more salt when they drain and refill the hot tub, or after topping off the water from a significant splash out. Will salt residue collect behind the pillows and/or on the spa components above the water? Keeping calcium hardness levels at the 50 ppm target will help reduce water lines and salt/scale formation. You may occasionally need to run a damp cloth around the bartop to keep it clean. How do I prevent salt buildup on the exterior of my spa and surrounding area? Periodically hose off your spa exterior, spa steps, and the deck or concrete surrounding your spa after use to prevent salt buildup that can occur from splash-out. Will the salt water harm decks or plants? It is recommended to regularly hose down decks and nearby plants since salt can accumulate to levels that can damage and discolour decking as well as kill plants. When draining the spa, follow all local codes and guidelines. The accumulation of scale caused by high levels of calcium hardness can be detrimental to hot tub components like the jet pumps and heater, as well as to the electrodes on the FreshWater® Salt System cartridge. Ensure that your calcium hardness levels are with the 25- 75 ppm range, with an optimum target level of 50 ppm. I have very hard water (high calcium hardness), what's the best way to fill my hot tub? The recommended calcium hardness range is 25-75 ppm with a target of 50 ppm. What is the On the Go portable hot tub water softener and why should I use it? The On The Go portable hot tub water softener is an effective and cost-efficient way to avoid issues that can result from having high levels of calcium hardness. The On The Go is easily attached to your garden hose and used to fill and top off the hot tub with soft water, and again when you eventually drain and refill your hot tub. The On The Go can be reused and recharged repeatedly, so it will last the life of your spa. What is the Vanishing Act® calcium remover and why should I use it? The Vanishing Act calcium remover is a patented product that removes calcium from the water, reducing the hardness – making spa water softer and more enjoyable for soaking. Can you be in your spa while the Vanishing Act is in use? Yes – but when you exit the spa restart the calcium removal process as noted on the box and in the spa owner’s manual and reposition the bag. Can I fill my spa with the water softener at my house? Yes – blend softened water and tap water to achieve the calcium hardness target of 50 ppm (recommended range is 25-75 ppm). How often will I need to drain and refill my spa with the FreshWater® Salt System? Many factors impact the life of hot tub water, such as bather load and water chemistry. When these factors are accounted for and the spa is properly maintained, the FreshWater Salt® System will keep water clean and clear for a full year. How often should I check my water with 5-Way Test Strips? It is recommended to test and balance your spa water before each use and weekly when not in use. The FreshWater® Salt System will remind owners via the control panel every 10-days to check and balance the spa water and confirm the Output Level. Following are the recommended optimal targets and ranges for your spa water. How often should I check my water with Salt Test Strips? It is recommended to test and balance your spa water before each use and weekly when not in use. The FreshWater® Salt System will remind owners, via the control panel, every 10-days to check and balance the spa water and confirm the Output Level. Will other water chemicals still be needed? Depending on the make-up of the spa water, other water chemicals may be needed. Chlorine will be needed to initially shock the spa and generate an initial chlorine residual. pH Up and pH Down will be needed to adjust the pH. MPS (monopersulfate) can be used in place of chlorine to shock the spa. Silver is recommended to inhibit bacteria growth, minimize chlorine demand, and extend the life of the water. Can I use liquid chlorine that contains iron? Liquid chlorine should not have iron in it. How do I decrease the amount of chlorine in my hot tub? Hydrogen peroxide can be used to reduce the chlorine level in the spa water. For more information refer to the FreshWater® Salt System the Owner’s Manual. What is cyanuric acid (chlorine) lock? Cyanuric acid found in granulated dichlor can bind chlorine in the water and make it inactive. Depending on the chemistry of your fill water the introduction of cyanuric acid may not allow the spa to maintain a chlorine residual even though the water appears to be clean and clear. If this is experienced, drain and refill your spa. Can I use Silver with my FreshWater® Salt System? Yes – Silver is highly recommended to use in conjunction with the FreshWater® Salt System to inhibit bacteria growth, minimise chlorine demand, and extend the life of the water. Since the salt system cartridge has its own housing in the bar top, the silver cartridge can be used per the instructions on the box, adapters are not needed. What do I do if my spa has cloudy water? How do I treat my spa for high metal content? What do I do if my spa does NOT have a chlorine reading? Check the Output Level setting – If you are using the spa frequently or have the Summer Timer on, you may need to increase the Output Level to a higher number. Use a FreshWater 5-way Test Strip to check the water and adjust the Output Level to maintain a 1-5 ppm chlorine level. Shock – Use the Boost option or manually add chlorine to clean the water and develop a chlorine residual. Check salt level – Ensure that the salt level is near the high end of the OK range (2,000 ppm) to ensure maximum chlorine generation. What do I do if my spa has a high chlorine level (above 5 ppm)? Check the Output Level setting – if you are using the spa less frequently you may need to decrease the Output Level to a lower number. Reduce the chlorine level – Add one (1) cup (240ml) hydrogen peroxide with jets running. Check chlorine level after 10 minutes and repeat as needed. Check the Internal Power Setting on the control panel – it may need to be decreased to a lower number. What is the “System Status” meter on the control panel telling me? Yellow OK – System is OK but should be monitored (see the Troubleshooting section on page 7 in the FreshWater® Salt System owner’s manual for more information). Red LOW – The system needs your attention and is NOT generating chlorine. The cartridge may be expired, or the salt level may be too low (see the Troubleshooting section on page 7 in the FreshWater® Salt System owner’s manual for more information). Red HIGH – The system needs your attention and is NOT generating chlorine. The salt level is high (see the Troubleshooting section on page 7 in the FreshWater® Salt System owner’s manual for more information). What is an Output Level and why is it important? The Output Level determines how long the salt system will run each day. Output Levels can be adjusted up or down to increase or decrease the generation of chlorine based on spa usage. Output Levels should be kept as low as possible while maintaining a chlorine level of 1-5 ppm. What is Boost and when should it be used? The Boost feature overrides the current Output Level and activates the cartridge to run at the equivalent of a 10 output level for 24 hours. The system returns to its previous Output Level once the Boost cycle is over. Boost should be used before and/or after heavy usage and when the chlorine level is very low from irregular usage schedule. If I lose power to my spa, will the 4-month timer for the salt cartridge reset? No – the spa will “remember” the time that has elapsed and resume the 4-month timer once power is restored to the spa. How does Summer Timer affect my system? When the Summer time is active, the FreshWater® Salt System is disabled for eight (8) hours each day. If the chlorine level of the spa falls below 1 ppm, increase the Output Level by one each day until 1-5 ppm can be maintained. How long is the warranty for the FreshWater® Salt System? The warranty only covers the controller for one year (may vary from country to country). The cartridge is a consumable item and is not covered under warranty. The entire warranty can be found on page 11 of the FreshWater® Salt System the Owner’s Manual. In what countries is the FreshWater® Salt System available? The system is available Globally, however due to regulatory requirements the Canadian release will be at a later time. What spas are compatible with the FreshWater® Salt System? All 2019 Hot Spring Highlife® and Limelight® Collection models are compatible with the FreshWater® Salt system. The system is not backwards compatible. What components of the FreshWater® Salt System are factory-installed? The salt cartridge housing, cap and removable plug will be factory-installed in all 2019 Highlife and Limelight Collection models. A FreshWater® Salt System start-up kit will need to be purchased to complete installation of the system. Is FreshWater® Salt System available for Hot Spot® models? No – all 2019 Hot Spot models are compatible with the very effective in-line FROG bromine system. Can Ozone be used with the FreshWater® Salt System? Ozone should not be used with the salt system because it reduces the amount of chlorine in a hot tub. The FreshWater® Salt System is designed to produce the proper amount of chlorine for the specified need. Using both systems together will cause the salt cartridge to work overtime to produce more chlorine than needed, and therefore may not last the full four months. Can bromine or floater systems be used with the FreshWater® Salt System? DO NOT use bromine or other floater systems with the FreshWater® Salt System. Is Connextion® compatible with the FreshWater® Salt System? No – Connextion is not currently compatible with the salt system. Is CoolZone™ compatible with the FreshWater® Salt System? Yes – CoolZone™ is compatible with the salt system. Please review the spa compatibility matrix for more information on CoolZone™ compatibility with specific spa models. Where can I find more information about the FreshWater® Salt System? Detailed information can be found in the FreshWater® Salt System Owner’s Manual or call us on: 0800 849 2468. What is the difference between the FreshWater® Salt System and the ACE® System? Both systems make chlorine from salt added to the spa water. The new FreshWater® Salt System is more affordable and is designed to require less maintenance than ACE and to be simpler to use. Can I get the FreshWater® Salt System if I already have ACE? The FreshWater® Salt system and the ACE System are both available options for all 2019 Highlife and Limelight Collection spas. Both systems should not be installed at the same time. The FreshWater® Salt System is not backwards compatible. Can I still get the ACE Salt System? Yes – the pass-through fittings will continue to be factory installed on all 2019 Highlife and Limelight Collections models and the ACE start-up kit will continue to be available for sale. Can I still purchase ACE replacement cells available for current ACE customers? Yes – ACE replacement cells will continue to be available for purchase.